This Thursday will mark the one year anniversary of the PLP election victory, with the 2017 General Election on July 19, 2017 resulting in the PLP winning 24 seats to the OBA’s 12, and claiming 20,059 total votes [58.89%] to the OBA’s 13,832 votes [40.61%]. 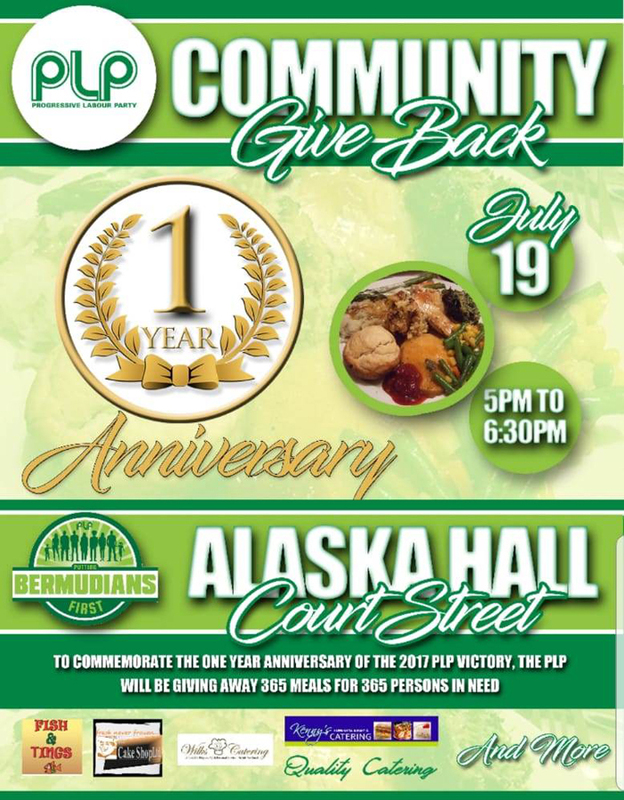 A PLP spokesperson said, “To commemorate the first anniversary of this administration, the Progressive Labour Party will be hosting a Community Give Back on Thursday, July 19, from 5 to 6:30pm at PLP Headquarters, Alaska Hall, Court Street, Hamilton. “This Community Give Back will provide 365 dinners to 365 persons in need. These dinners will be served by the Premier, Members of Parliament, Senators, members of Party Executive, and other Party members. Those who are to benefit from this give back should attend Alaska Hall on Thursday, July 19 to receive this free meal. “Confirmed donors thus far are Fish n Tings, Wilks Catering, The Cake Shop Ltd., Kenny’s Kitchen, and Quality Catering, plus members and friends of the PLP family. Any other potential donors are invited to contact PLP headquarters at 292-2264 from 10am to 2pm. How about giving back all those ‘cost overruns’. Just in time to quiet all the supporters down. Free this and that to keep them quiet.